It started out a pretty chilly morning, me and my nephew were hunting. We first encountered a 6 point. I was grunting at him and my nephew shot at him and missed him. We found his arrow and for sure it was a miss. Then we decided to go to the jeep and have a snack and a drink around 9:30am. I asked him what he would like to do and he said he wanted to go to his stand near the field. So, I said I will go to my stand in the thicket. He went around the top and I started to head to my stand. I was walking very slow and taking my time and got up to this little ridge at about 10:20am. I was looking around and saw something move up ahead. I looked hard and saw a big rack coming down the edge of the opposite ridge. I could barely get my release on my bow string I was shaking bad. It seemed like it took an hour. Finally I got it on, looked around and didnt see the buck, but the ridge dropped a little and he was in there. Then I saw him trotting toward me. I couldnt believe it when he got in 20 yards. I made a sound with my mouth, he stopped and I let the arrow fly. I saw my lighted nock pass right in his right side and he ran toward my jeep to where I heard him groan very loud. I set my bow down and walked around in awe wondering, "Did I just shoot a monster?" I was shaking bad. I cried out to my nephew who headed down the thicket towards me. When I first saw him I said, "Man, I love you nephew." He looked puzzled and asked, "Did you shoot a doe or something?" I looked for the arrow were I shot him and couldnt find it. I knew where I heard him fall so we walked over there and both of us hugged and couldn't believe... there is the biggest buck of my life with my arrow sticking out his left side. I pulled it out and my nock was blinking away. I had to call my wife and daughter to come help us get the deer in my jeep and we all just couldn't believe it. I would like to dedicate this buck to my nephew because 12 days before this my nephew had brain surgery and I was elated to be out there with him hunting. I couldnt wait to get home to show my son. 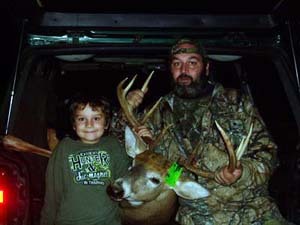 The buck was scored by my taxidermist around a 152 inch green score.